Flies are plentiful this year. Here are some tips to get control of disease carrying pest flies. If your windows have screens, make sure there aren't any holes or tears. Good screens are effective tools for keeping these pests out. Also check the seals around doors to make sure there are no cracks that would allow insect access. Flies love stinky things and dirty places. Keep your inside garbage cans as clean as possible. Keep food left on the counter covered. Always clean up any spills promptly. The drains in your sinks, bathtubs, and showers are great breeding grounds for flying pests. Clean out your drains at least once a month. Pour boiling water down your drain to clean out and kill any fly eggs or larvae that may be hanging around. Be sure to cover the drain after your pour the water to trap the heat and steam for a brief period of time. Adding two ounces of orange oil per gallon of water will help. Old fruit should be discarded to discourage fungus gnats and potted plants should be allowed to dry out between watering. For infestations, Bti products can be applied to the soil. Flies hate the smell of lavender oil. Lavender also has a calming effect on everyone in the house. Use 1 cup of ice and 2 teaspoons of Texas Pete hot sauce mixed together and leave out for flies. They can’t resist it! They will land on it, fly away and die within minutes. Mix vinegar, hot sauce, dawn dish soap and water in spray bottle. Spray as needed. Buy a bottle of Mad Dog 20/20 (fortified liquor), open it, and leave it out overnight. Your fruit flies will be gone within a day. For controlling dog ear – biting flies, pick up the dog poop every day. The blood-sucking flies need the droppings for their egg laying and life cycle. This is a solution that some homeowners, farmers, ranchers and restaurants have used with great success. Something about the way the water bulging in a clear plastic bag causes a prism effect and confuses the fly. Who knows what flies think. Maybe they just don’t feel comfortable flying around a place that hangs up bags of water. The rounder and plumper you can get the bags, the better fly control. Bags that get dusty or dirty need to be cleaned or replaced or they won't work. Some people recommend putting a few pennies in the bag, but water without the pennies seems to work. Another theory on why bags work is that houseflies are defenseless, nervous and don't like to sit still when they see something moving nearby, because it could be a predator. 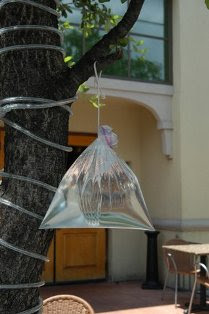 A water bag acts like a lens where the movements of people and plant foliage in the area are reflected. Even the shifting of light and dark in the water bag could be interrupted as dangerous movement. Other insects aren’t bothered as much by the bags apparently. It may be because other insects have different kinds of eyesight. Commercial fly parasite products help greatly in ending fly problems. They are available by mail order from companies like Arbico Organics.